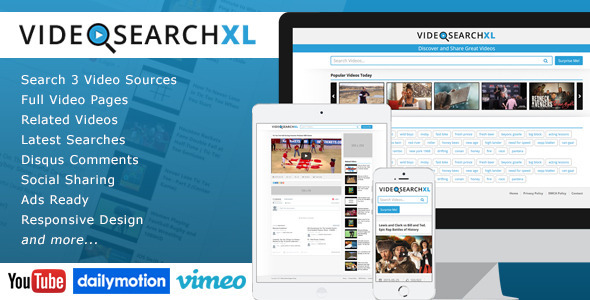 VideoSearchXL – Multi Source Video Search Engine Created by ArmorThemes. This templates have specific characteristics, namely: With VideoSearchXL you can run your own multi source video search engine website within minutes. Let your visitors search for videos from the 3 most popular video websites YouTube, Dailymotion and Vimeo at . You can use this VideoSearchXL – Multi Source Video Search Engine on Php scripts category for carousel, dailymotion, php, responsive, search engine, video, vimeo, watch, youtube and another uses. This easy to install PHP script has a clean responsive design making it easy for mobile, desktop or tablet customers to view and navigate. The homepage features a slider for the most popular videos today and your visitors latest video searches. You have the option to select to show popular videos from your country only. Searching for videos is done using the YouTube, Dailymotion and Vimeo Api’s, you will get 5 search results from each source for every page. Discover new videos by clicking the ‘surprise me’ button to view a random video. All video pages also display 10 related videos and an optional Disqus comments box and optional AddThis share buttons. All pages are with SEO OpenGraph meta tags and search engine friendly URL structure optimized for search engines like Google to crawl and index your site. With advertisement spots in place you can easily add Adsense or affiliate ads to monetize your website. VideoSearchXL makes it fun and easy to find, view and share videos. Select local country option for ‘Popular Videos Today’ carousel. Improved ‘surprise me’ button function. Not show empty results when no videos are found. Added custom keyword blocker function. Added optional homepage leaderboard ad. Fixed search terms with special characters.